The University of New Brunswick Saint John today announced that New Brunswick students, Emily Derrah of Grand Bay-Westfield, Alicia Killam of Quispamsis, and Amelia McCavour of Quispamsis are this year’s recipients of the Arthur and Sandra Irving Primrose Scholarship valued at $40,000 ($10,000 per year for four years). This year’s scholars come to UNB Saint John with a history of exemplary achievements as community leaders, athletes and students. Emily Derrah, a Harbour View High School student, is an active community volunteer having travelled to Kenya to work with high school students affected by HIV or AIDS. Alicia Killam, a Kennebecasis Valley High School student, is also an avid community volunteer through her involvement with outreach initiatives, as well as with local shelters and food banks. Amelia McCavour, another Kennebecasis Valley High School student, is a volunteer for organizations such as Habitat for Humanity and the Heart & Stroke Foundation, as well as a soccer, volleyball and basketball player. “Alicia, Amelia and Emily, as Primrose scholars, are wonderful examples of outstanding students entering UNB Saint John who will excel in their chosen fields of study and will also give back to the university and the greater community because of their commitment to helping others,” says Sandra Irving. Designed to support students entering their first year at UNB’s Saint John campus, the Arthur and Sandra Irving Primrose Scholarship recognizes academic achievement, community involvement and athletic leadership. The scholarship was established by Sandra Irving, a proud alumna of the university’s Saint John campus (BA’95), who spearheaded the fundraising activities to first award the scholarship in 2000. Primrose Scholarship recipients have a history of great achievement and they have gone on to become doctors, engineers, nurses, scientists, business leaders, artists, and community leaders. Photo: Back row: John Johnson, Sandra Irving, Sarah Irving, and Arthur Irving. 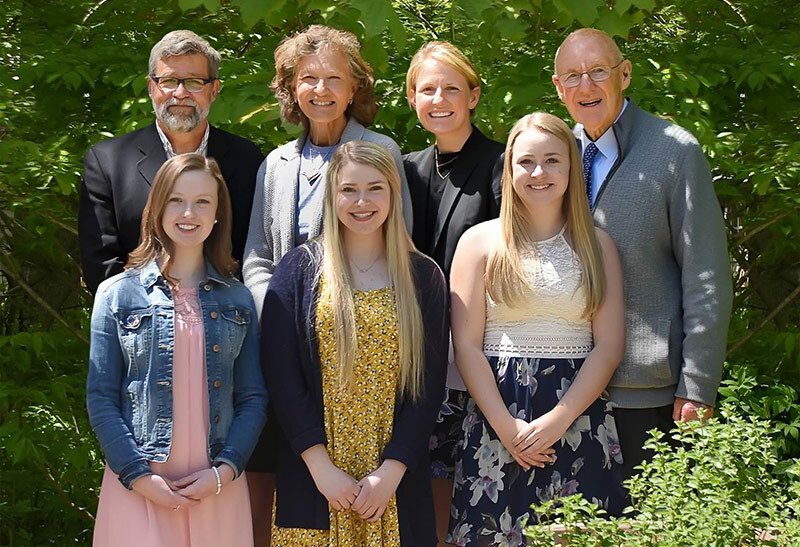 Front row: Alicia Killam, Amelia McCavour and Emily Derrah are the 2018 recipients of the Arthur and Sandra Irving Primrose Scholarship valued at $40,000.